What’s it like to worship at Saint Thomas? Worship at St. Thomas follows the same pattern almost every week. We begin with prayer and praise, then hear three readings from the Bible and sing a psalm together. There’s a sermon, a hymn, a shared reading of the Apostles’ Creed, and a time of shared prayer, the Prayers of the People. These include prayers for the church, peace among nations, faithful care of creation, healing, and other matters of concern to the members. A list of people who have requested prayers is kept and all are lifted up in prayer. At the end of the Prayers of the People, we greet one another with the Peace of Christ. Then comes the Offering. Some people make an offering of money. Some people make an offering of their hopes and intentions, or even their questions and doubts. There’s always an offering of music as well. 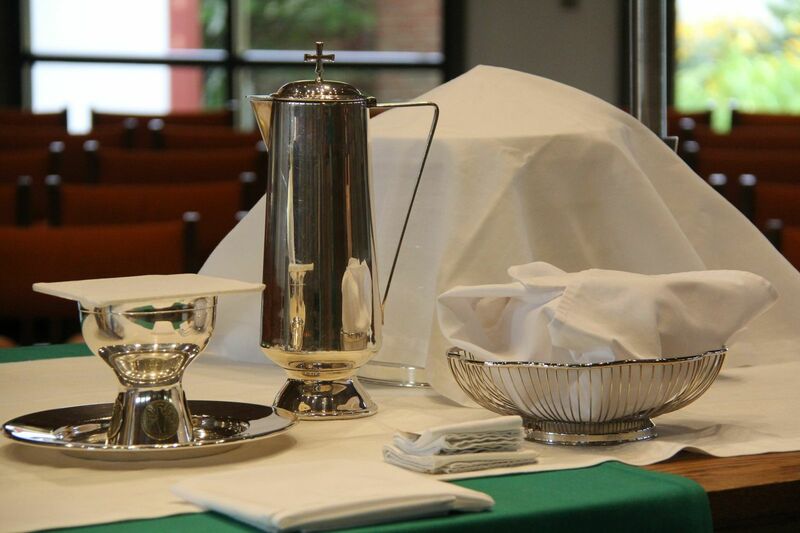 After we give thanks together for all these offerings, we begin the service of Holy Eucharist. The bread and wine of Holy Communion are our sharing in this heavenly banquet. Through it we are connected to Christians all over the world and throughout time. After everyone who comes forward has received, there are a few more prayers and blessings, a hymn, a dismissal, and a postlude. Worship that follows this pattern is usually called liturgical worship and the service itself is called liturgy. As liturgical churches go, St. Thomas is middle-range – our worship is dignified and orderly, but not starchy or formulaic. If liturgical worship is new to you, you may find it takes you a few weeks to become accustomed to it – but Christians have worshiped this way for many hundreds of years, so we hope you’ll take time to give it a chance. About forty people work together every Sunday on worship. The presider, preacher, deacon and acolyte are all easy to see – they’re wearing white albs. Don’t forget to count the choirs, the choir director, the children’s choir director, the organist, the ushers, the greeters, the servers. Behind the scenes, volunteers have washed and polished the altar dishes, arranged flowers, and looked after the candles, vestments, and the altar linen. Almost all these people are volunteers. We do it because we love this liturgy. We are guests, like you, at Jesus’ table. We come to enter into the Body of Christ, to be fed by the Body of Christ, and to carry the Body of Christ into the world we live in every day.